A copy of The Cabinet of Dr Blessing was sent to Confessions of a Reviewer by the author Jack Rollins in exchange for an honest review. This is said review. This book is published by Dark Chapter Press. 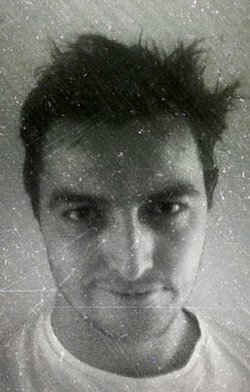 So I have only read one other thing by Jack Rollins and that was his story The Séance and if you want, you can read the review of it here. It was set in the Victorian era. An era that I love reading books from. One thing I have noticed is there aren’t too many people capable of pulling off the particular style of prose needed to make a Victorian book enjoyable. Jack Rollins did that with The Séance. 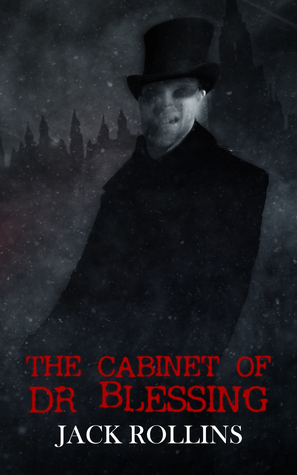 I was hoping he would do it with The Cabinet of Dr Blessing as well. The story starts in 1859. Dr Blessing is a GP in London. A well respected man by the public and his peers. He is called, unexpectedly, to assist a young prostitute who is going through a very rough labour. Not what a gentleman of his position would normally do in those times but being the person he is, he rushes to help. It is clear to him very early that the birth is not going well. Something appears to be wrong with the baby itself. It seems to him it is abnormal. The “lady” unfortunately dies giving birth and as far as everyone else knows, the baby does not survive either. Dr Blessing knows different though. He spirits the “creature” away, and so begins the destruction of Dr Blessing’s life as he knows it and the destruction of London as everyone else knows it. I seriously don’t want to type anything else in this review. I simply want you to go buy this book. There are four months of the year left for another book to knock this one off my number one spot. I seriously don’t think that will happen. This book is made up of the first three parts of the Dr Blessing saga. Dr Blessing’s Curse, Dr Blessing’s Rapture and A Christmas Blessing. So….to review it. Characters wise? Superb. Every single one of them. Main characters we see all of the time are of course Dr Blessing, a well-respected man. An intelligent man he is an all-round good person but outside forces have him trapped in a never ending spiral that he cannot escape from. I’m not sure he wants to though. We have Charlotte, the rich widow of one of Blessings friends who has unfortunately died. She is looking for answers to many questions about her husband’s death and thinks Blessing has the answers. We have Niamh, a young girl who Blessing adopts through circumstances surrounding the “birth”. A kind street girl who totally embraces her new way of life. Francis and Edward are friends of Blessing’s who would do anything for him and end up doing more than even they expected they might. In evil character terms we have Charles, Bear and Freddy. Hired thugs who really have no limits as to what they would do. Then we have the mysterious Mary Brigham or Black Mary as she is known at times. She belongs to a secret organisation hunting evil. A highly trained Victorian era assassin, she is more than capable of looking after herself and dealing with anything that is thrown at her. Then we have Dr Blessing’s “child”. The creature. An evil being that controls him in ways he cannot stop. A creature that as the story progresses, scared me more and more every time it was mentioned. The plot? Not telling you. I can’t. It would give everything away about the way the story progresses and I do not want to do that. You have probably already guessed that it involves a creature. It’s what that creature does and what it is that drives the story. What it does to Blessing and in turn makes him do to others. The story goes in directions you would never think it could. It starts in a small study and seems to be confined to that one room until other things develop and you learn things that have been happening that no one, apart from Blessing knew about and then, through circumstances caused by different characters interfering in stuff they really shouldn’t, it escalates to a point where it could mean the total annihilation of the population of London and beyond. I make no secret of being a huge fan of books set in the Victorian / Edwardian era. This was all brought about by the writings of one William Hope Hodgson. If you haven’t read his work then seriously go get some of it. A lot of his stuff is free for Kindle. I have only really come across one other writer that comes close to Hodgson for me and that is Willie Meikle. His Carnacki stories are amazing and he truly captures Hodgson’s style and I know if Hodgson was still alive today he would be giving Willie a huge pat on the back. Jack Rollins is filling the gap that Hodgson left. I cannot emphasise enough how beautiful the writing is in this book. It absolutely, totally captures the complete atmosphere of the 1850’s. You can sense it. You can smell it. You can visualise everything in this story. The clothes the people wear. The way the streets and houses would have been in those times. The way the people had to rely on their own wits and very limited weaponry. The lack of fast transport and all of the things we take for granted in modern times. This book truly makes you feel like you have travelled back in time to a bygone era. It’s beautiful. Then you have evil. An evil that makes your skin crawl as you read. An evil that would be nearly impossible to deal with in our times with all the technology that we have and the knowledge we have one hundred and sixty years later. To summarise: a beautifully written Victorian horror story that will make you believe you are living in the times and truly make you believe that the only thing you can do to deal with the evil it presents is run. Run very fast and don’t look back. If you would like to help support Confessions of a Reviewer then please consider using the links below to buy The Cabinet Of Dr Blessing or any other books from Jack or indeed anything at all from Amazon. This not only supports me but also lets me know how many people actually like to buy books after reading my reviews. A chilling tale of gothic horror, told in three parts, collected in one volume. Dr George Blessing operates in his Victorian London hospital. Sympathetic to the poor, Blessing is summoned to a traumatic childbirth. There he discovers a creature of nightmarish power and malevolent intent, whose unearthly abilities he wants to harness for the good of mankind. When he reveals the secret to a friend after a dinner party, Dr Blessing's obsession triggers events threatening to destroy his reputation, his family and the entire city. As the creature grows ever more powerful and suspicious investigators close in, the doctor is one step from death at every turn. Told in the tradition of a penny-dreadful, each part intricately spins a gripping web of secrets, lies and death, blending "Hammer House of Horror" style scares with fast paced action. Jack was born and raised among the twisting cobbled streets and lanes, ruined forts and rolling moors of a medieval market town in Northumberland, England. He claims to have been adopted by Leeds in West Yorkshire, and he spends as much time as possible immersed in the shadowy heart of that city. Fascinated by all things Victorian Jack often writes within that era and his period gothic horror works include The Séance and The Cabinet of Dr Blessing. Thanks David. I need to get on to these De Omori ones of yours!